A while ago I wrote an article on winches and asked the question as to their viability. In the article, I discussed that unless you were a complete 4wd nutter like myself or working / living in an environment where you are likely to get stuck on a near daily basis then — pretty much a waste of money. One piece of equipment that is, in my opinion, invaluable is the high-lift jack. There are various makes including hi-lift and jack-all but they all do much the same thing; only some have a higher safe working load than others. 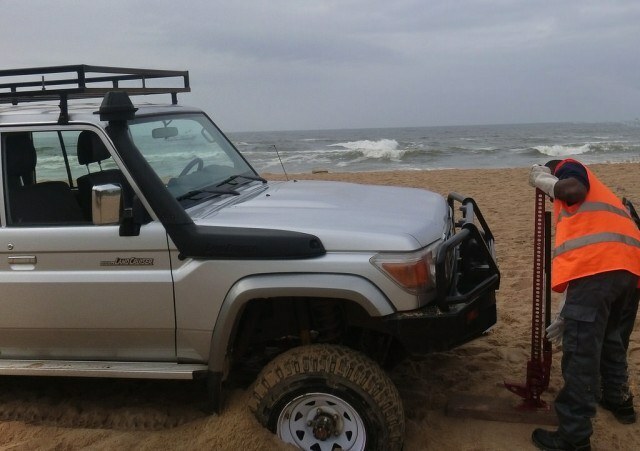 This is important to take into consideration if you are driving a heavy 100 series Landcruiser. 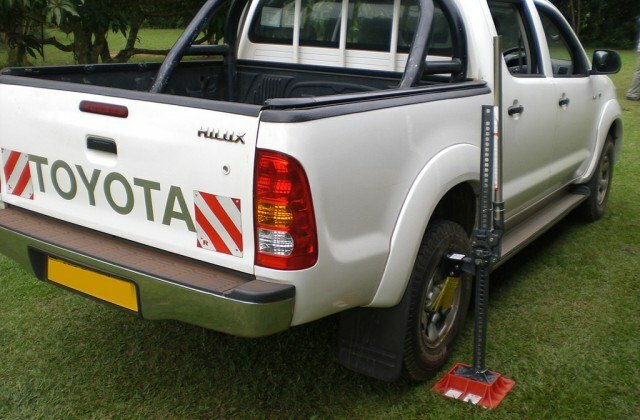 The good thing about the jack is, not just it’s capability of lifting the vehicle high off the ground, but also to be used as a winch, splitting logs and clamping together timber or other material. In other words, you can use it for more than one task and this can save valuable loading space in your vehicle when planning to go on a long safari. Useful, but dangerous if operated incorrectly! I have heard horror stories of eyes, teeth and digits being lost and operators knocked unconscious because of a “misunderstanding” of how much force is on the jack handle as it is being released. Hi-Lift have their user manual available on-line. Safety is the key (as with all recovery equipment). When lifting your vehicle off the ground, you are making it unstable, so generally the jack should only be used in this configuration for recovery when stuck in ruts or soft ground where you need to put some material under the wheels to clear the diff casing / leave springs. Also, unless you have approved jacking points on the vehicle that can accept the jack safely, then it should not be used to change a flat tyre. Don’t rely solely on a bit of angle iron welded to the chassis (as they do here). This might be good enough to help lift the vehicle but it does not make it stable enough to change a wheel. 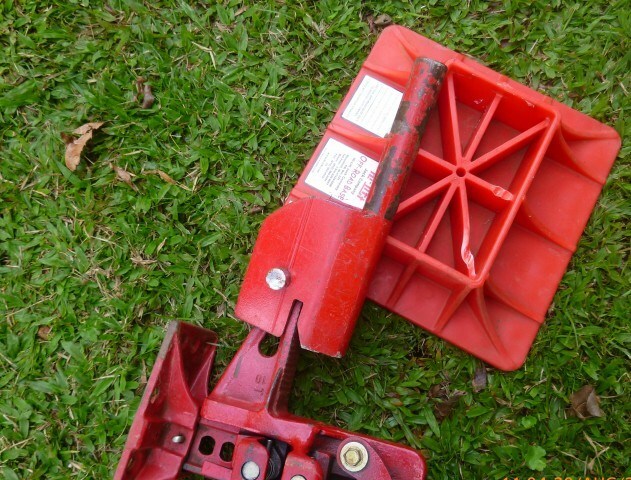 When using the jack on soft ground it is advisable to use a base to spread the weight. You can buy the neoprene ones or you can go and get yourself a good chunk of hardwood from Ndeeba (less expensive, can be used for other things and takes more abuse). For use as a hand winch, you will need to buy a few extras to go along with it. You can buy complete kits, which cover all bases and are well worth the investment as the contents can also be used for other things as well. Depending on what size jack you buy, either 4 or 5 foot will depend on the amount of pull you get on the first try. Generally, in my experience, two 3 ft pulls backwards will generally get you out. Again, read the manual (preferably take a course), do some dry runs with the equipment first and don’t forget to use the gloves supplied in the kit. Think safety first!